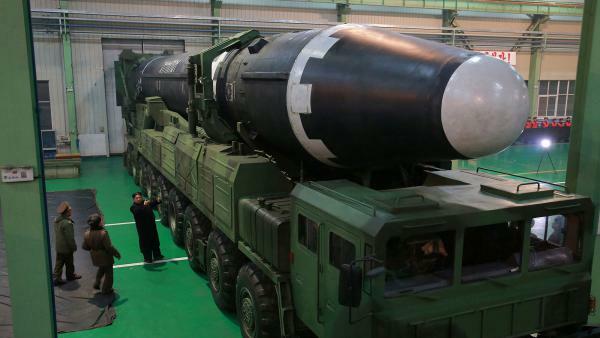 North Korean leader Kim Jong Un views the Hwasong-15 missile in this undated photo released by North Korea's Korean Central News Agency. The missile is believed to be capable of reaching the continental United States. The day after Secretary of State Mike Pompeo took the oath of office in early May, State Department spokeswoman Heather Nauert declared that four letters — CVID — would be the Trump administration's dogma for dealing with North Korea and its nuclear weapons arsenal. "The government likes acronyms so much, we've got a new one: CVID — complete, verifiable, irreversible denuclearization," Nauert told reporters at the department's daily briefing. "That is our policy and that is the policy of Secretary Pompeo." Never mind that at his swearing-in ceremony, Pompeo actually had referred to what more accurately could be called a PVID policy. "We're committed," he declared, "to the permanent, verifiable, irreversible dismantling of North Korea's weapons of mass destructions program." For North Korea experts, CVID is hardly "new". "I think it was an invention of the Bush administration," says the Stimson Center's Joel Wit, a former diplomat who oversaw the implementation of the "Agreed Framework" nuclear deal with North Korea during the Clinton administration. "Our goal — complete, verifiable, irreversible dismantlement of North Korean nuclear programs," State Department official James Kelly told the Senate Foreign Relations Committee in 2004, "has been dubbed by the South Koreans 'CVID.' "
So while denuclearization seems to have displaced dismantlement as the D in CVID, the catchphrase that guided the Bush administration's failed Six-Party Talks with North Korea endures. That worries Robert Gallucci, a Georgetown University professor who was the Clinton administration's chief negotiator with North Korea. "My concern here is that we latch onto a standard which is, physically, not actually plausible," says Gallucci. "There's no way of doing something that's irreversible, that I know of." Gallucci says the 1994 Agreed Framework did lead to "serious dismantlement" of Pyongyang's nuclear weapons program, followed by "serious reconstruction" of that same project after the deal's collapse in 2002. "As long as the scientists and engineers who designed and built the facilities are still alive and living in the country," he says, "it can be built again." Concerns about whether denuclearization — however it's defined — is plausible were raised this week during a Senate Foreign Relations Committee hearing chaired by Colorado Republican Cory Gardner. "Complete, verifiable, irreversible denuclearization — do you believe Kim Jong-un is committed to that level of CVID?" Gardner asked Joseph Yun, who was the State Department's point man on North Korea before resigning in March. "I would say we don't know," Yun replied. Victor Cha, the George W. Bush administration's top Korea expert, was the other witness at that hearing. "They don't use that phrase in the same way that an untrained ear might hear it," said Cha, referring to North Korea's notion of denuclearization. "They use it to mean, sometime in the future, they believe that the Korean peninsula should be free of weapons — when there is no longer any threat in the world to North Korea." Yun, for his part, told the panel the U.S. should be taking a step-by-step approach with North Korea. He recommended that approach be guided by a different "D" word. "The crucial step is the first step: declaration," Yun said, calling the submission of a detailed inventory of North Korea's nuclear holdings a litmus test of good faith for when Kim Jong-un meets with President Trump in Singapore. "Without knowing what they have, how are you going to negotiate with them?" Former nuclear negotiator Gallucci says the problem with a declaration is that it could not be completely verified, given how easily North Korea could stash away, say, ten undeclared kilograms of plutonium. "The amount of fissile material used in the nuclear weapon that destroyed Nagasaki was a little smaller than a baseball, maybe more like a cueball," Gallucci tells NPR. "Are we going to verify down to the level of 5 or 6 cueballs in North Korea? I don't think so." That said, the world will nonetheless likely hear many more references in the coming weeks to CVID — dusted off, tweaked, and once again in vogue, this time with the Trump administration. CVID is an acronym you're about to hear a lot. The Trump administration has been using it in the run-up to next week's summit with North Korea. And those four letters have meant different things to different people, as NPR's David Welna reports. DAVID WELNA, BYLINE: Last month at his swearing-in ceremony, Secretary of State Mike Pompeo laid out what you might call a PVID strategy. MIKE POMPEO: We are committed to the permanent, verifiable, irreversible dismantling of North Korea's weapons of mass destruction program. HEATHER NAUERT: We're calling it CVID now. WELNA: That's State Department spokeswoman Heather Nauert the very next day. Overnight, Pompeo's permanent turned into complete, and his dismantling was now denuclearization. NAUERT: The government likes acronyms so much. We've got a new one - CVID, complete, verifiable, irreversible denuclearization. That is our policy. And that is the policy of Secretary Pompeo. WELNA: CVID, in fact, is not new at all. Here's State Department official James Kelly 14 years ago explaining to Congress the George W. Bush administration's nuclear talks with North Korea. JAMES KELLY: Our goal - complete, verifiable, irreversible dismantlement of North Korean nuclear programs. WELNA: So while dismantlement has been replaced by denuclearization, the CVID catchphrase endures. That bothers Robert Gallucci, who was chief negotiator with the North Koreans during the Clinton administration. ROBERT GALLUCCI: My concern here is that we latch onto a standard which is physically not actually plausible. WELNA: Gallucci, who now teaches at Georgetown University, says demanding North Korea's irreversible denuclearization is simply unrealistic. GALLUCCI: As long as the scientists and engineers who designed and built the facilities are still alive and living in the country, it can be built again. WELNA: And it's not at all clear that denuclearization, however it's defined, is the plausible demand. Yesterday at a Senate hearing, Colorado Republican Cory Gardner raised that concern with Joseph Yun, who before quitting in March was the State Department's point man on North Korea. CORY GARDNER: Complete, verifiable, irreversible denuclearization - do you believe Kim Jong Un is committed to that level of CVID? JOSEPH YUN: I would say, we don't know. WELNA: Testifying alongside Yun was Victor Cha, the top North Korea expert in the Bush administration. He said while North Koreans too speak of denuclearization, they're not talking about giving up their nuclear arsenal in the foreseeable future. VICTOR CHA: They use it to mean, sometime in the future, they believe that the Korean Peninsula should be free of weapons when there is no longer any threat in the world to North Korea. WELNA: Yun, for his part, said the U.S. should be taking a step-by-step approach with North Korea, guided by a different word that also begins with the letter D.
YUN: The crucial step is the first step - declaration. Without knowing what they have, how are you going to negotiate with them? WELNA: Strikingly, neither of these seasoned North Korea experts used that old term, now back in vogue, CVID. David Welna, NPR News, Washington. (SOUNDBITE OF ROSETTA SONG, "A DETERMINISM OF MORALITY") Transcript provided by NPR, Copyright NPR.